Ezio Auditore continues on the assassin trail, following his training in the prequel Assassin’s Creed Renaissance. What started out as a vendetta for his family’s murder turns out to be fierce battle between the forces of good and evil. Ezio soon finds out that he has bitten off more than he can chew. It’s a one-man army against the ruthless Borgia family. Ezio’s skills as a master assassin are tested time and again. In a desperate situation, only Ezio’s quick thinking can save his life. Mario continues to play the role of a mentor and guide for Ezio. However, Mario is literally courting death and he seems to be running out of time. There’s still a lot that Mario has to pass on to his prize pupil, Ezio. Will he be able to make it to the end or will the clock stop ticking for him soon? Ezio wields an ancient weapon of power, the apple, which he and Mario managed to secure in The Renaissance. The question that now confronts him is, when and how should he use the apple? Assassin’s Creed Brotherhood is set in 15th century Rome. The glory of Rome has long evaporated into the now colossal ruins that stand as silent witnesses to the fall of a mighty empire. The degradation hasn’t left the people of Rome unaffected. Torn by strife, hunger, oppression and tyranny of a callous ruler, the people of Rome are living in the shadows of death and privation. 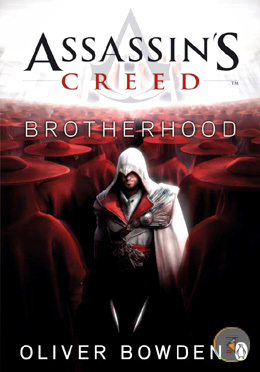 Time isn’t a luxury for Ezio, deception and betrayal is rampant even among the closely knit brotherhood. With Cesare Borgia determined to take over all of Italy, can Ezio Auditore be the people’s savior? The fate of Rome now rests in his hands. Oliver Bowden is the pen name used by well-known writer Anton Gill for his Assassin series. Anton also writes under the pen names Antony Cutler and Ray Evans. Bowden’s other published books in the Assassin series include Assassin's Creed: Renaissance, Assassin's Creed: Revelations, Assassin's Creed: Forsaken and Assassin's Creed: The Secret Crusade. His other fictional works include The Sacred Scroll, An Honourable Defeat, The Journey Back from Hell and Berlin to Bucharest. Bowden was born in Ilford, Essex. He grew up in London and went to Chigwell School and later attended Clare College, Cambridge. He began his career as an actor and quickly moved on to theatre direction. He worked as a writer/producer for BBC and TV-am before deciding to take up writing full time.